I missed Thanksgiving this year. Not the meaning…I woke up that day thinking about how thankful I am for my family and friends and dogs. However, I am a nurse, and that means sometimes having to work a holiday. And this year, it meant working a double shift. So while my daughter was enjoying Thanksgiving dinner with her girlfriend’s family, I was taking care of people. Now, if I worked in a hospital, I’m sure my co-workers and I would have plotted a makeshift holiday meal. But I am a visiting nurse, spending my shift bouncing between the homes of my patients. I ate Fresh Direct Thai Noodles for Thanksgiving this year. I wasn’t going to let the holiday weekend pass without having a bit of turkey and perhaps a bit of cranberry. But I must tell you that I really don’t like traditional Thanksgiving items (EXCEPT for stuffing, oh how I love stuffing). I tend to like spicier foods. Which brings me to my Sunday after Thanksgiving dinner. 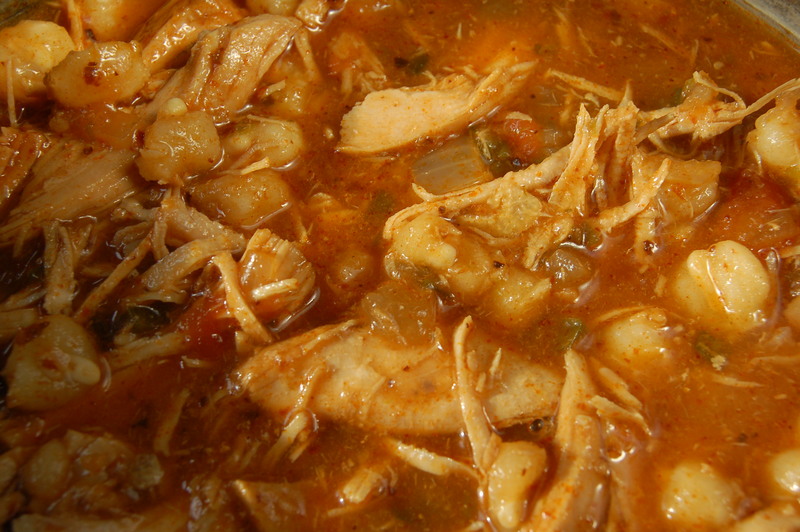 Turkey Pozole Rojo. Pozole is a traditional Mexican stew, made from nixtamalized corn (dried corn treated with calcium hydroxide, also known as hominy) and meat (usually pork, chicken or turkey) in a chile-spiked broth. I usually make mine with pork, but I thought I would branch out and experiment with turkey. But don’t wait for a missed Thanksgiving dinner to try this…Pozole is one of my favorite ways to keep warm on a cold winter night. Where does the cranberry come in? Well, we had a cranberry-jalapeno sorbet for dessert, just to keep in line with this year’s Mexican theme. Who knows, perhaps next year I’ll try turkey tamales! Serves 8-10. This is a wonderful way to use up leftover turkey, including the turkey carcass. If you are not making your own turkey stock, you can substitute a good quality store-bought chicken stock. But I encourage you to try making your own…it really is superior to store bought! This stew is best made a day in advance, allowing the flavors to meld. Leftovers keep in the refrigerator for up to 4 days or can be frozen up to a month. In a large pot combine turkey carcass, onion, carrots, garlic, salt and 12 cups of water. Simmer, covered, for 3-4 hours. You can also put everything in a crockpot and cook on low overnight. Pour stock through a sieve to strain out solids. You can use immediately, or place in mason jars in the fridge until ready to use. If refrigerating, the fat will solidify and is easily skimmed off prior to use. This makes more than you will need. Use the extras within a week or freeze up to 2 months. Shredded cabbage, chopped cilantro, sliced avocado, sliced jalapeños, sliced radishes and lime wedges for garnish. 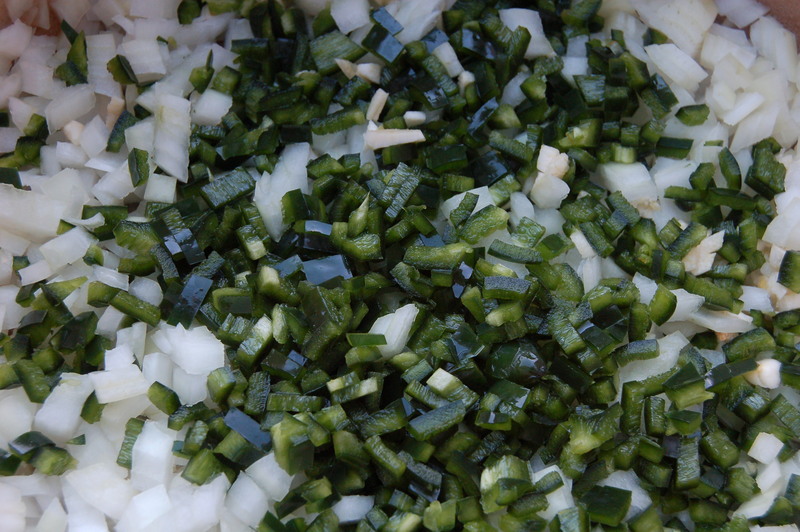 In a large soup pot, saute onions, garlic, and poblanos in 2 tablespoons olive oil, until soft, about 5-10 minutes. While vegetables are cooking, heat 1 cup of chicken stock to boiling, then pour over pasilla (or ancho) chilis in a small bowl. Let sit until softened (about 5 minutes). Place in blender with a can of tomatoes and puree. Add puree to vegetables in the soup pot, along with oregano, hominy, and remaining chicken stock. Bring to a boil, then simmer with a lid on for 30 minutes. Add shredded turkey and keep at a simmer for another 30-60 minutes. You can serve immediately, or refrigerate overnight to allow flavors to meld. Preheat oven to 350 degrees. Brush tortillas with 1 tablespoon olive oil and cut into strips. 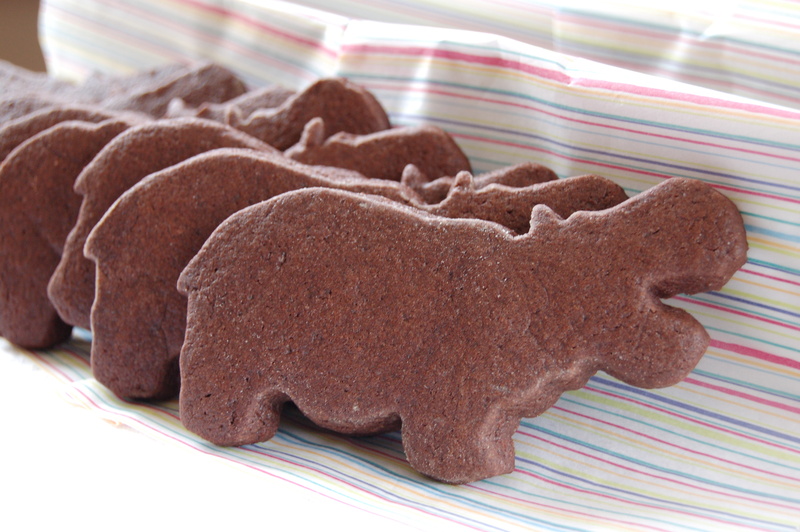 Scatter on a cookie sheet and bake until toasted, about 15 minutes, stirring after 10 minutes. Let cool. Heat pozole over medium heat until hot. Place tortilla strips, cabbage, cilantro, jalapeño, radish, lime and avocado in small serving bowls. 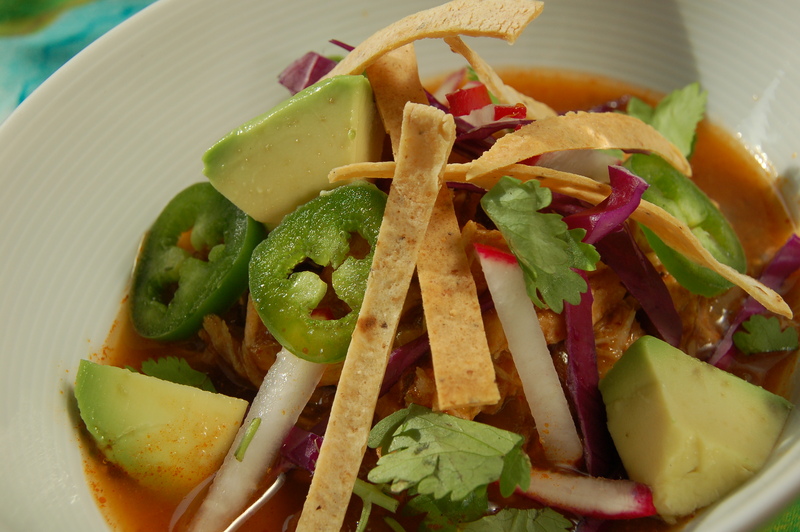 Ladle pozole into soup bowls and allow each guest to top pozole with desired toppings. Enjoy! This looks delicious! Are there any leftovers? It’s sad that I’m having soup from the can while reading this. It looks great!